The hotel will host their annual Thanksgiving Day brunch in the Park Ave Ballroom. First seating is at 1pm and second seating at 4pm. The buffet sections include antipasto and tapas, hot soup, salads, seafood, a hot section, carving stations, and a dessert station. Reservations via the website. Canvas is offering a three-course Thanksgiving meal featuring a main course of Slow Roasted Turkey with sausage stuffing, Yukon gold mashed potato, green beans, citrus cranberry sauce, and turkey gravy. For reservations, call 407.313.7800. Chroma is offering Thanksgiving a la carte, including a Turkey Roulade with Brioche Stuffing, Turkey Gravy ($13). For reservations, call 407.955.4340. Enjoy a three-course Thanksgiving dinner including an appetizer, main entrée featuring Slow-roasted Turkey Breast with trimmings and a dessert. For reservations call 407.351-5074. Located on Orlando’s restaurant row in Dr. Phillips, this steak and seafood restaurant will be offering their full a la carte menu as well as a traditional Thanksgiving dinner of sliced turkey, green beans with sun-dried tomatoes, brioche sage stuffing, roasted butternut squash, and more. Free valet parking. For reservations call 407.355.3011. The popular seafood restaurant is offering a Traditional Turkey Dinner (Herb roasted turkey breast, cornbread stuffing, whipped potatoes, green beans, cranberry relish, pan gravy). For reservations, call 407.934.2628. The Rosen Centre’s Cafe Gauguin will be offering a huge brunch buffet with over 55 items, and complimentary champagne to diners 21+, from 11am to 7pm. Enjoy traditional Thanksgiving dishes, along with an omelet/waffle station, salads, a carving station, seafood, and a huge dessert section. Free valet parking with validated receipt. Enjoy a special 3-course Thanksgiving dinner feat Carved Porchetta served with chorizo stuffing & maple-glazed brussels sprouts. For reservations, call 407.226.2929. Enjoy a a Greek-style prix fixe feast with your choice of appetizer, entree and dessert. For reservations, call 407.351.8660. Terralina is offering a grappa marinated roast turkey, pancetta-apple bread stuffing, buttered green beans, garlic mashed potatoes, roasted winter squash, and natural gravy. For reservations, call 407.934.8888. Enjoy traditional holiday fare along with other delicious options from the fresh and authentic seasonal buffet menu, all set in the grand dining room of a European villa. Reservations available online. Enjoy a Caribbean-style Thanksgiving Day Buffet from 10 am – 9 pm. Entertainment includes a steel drummer, face painter, balloonist and Universal characters. For reservations, call 407.503.DINE (3463). Enjoy a Thanksgiving Holiday Buffet among the sights and sounds of the South Pacific from 11 am – 9 pm. Entertainment includes a musician and hula dancer, face painter, balloonist and Universal characters. For reservations, call 407.503.DINE (3463). Enjoy a Thanksgiving Buffet from 11 am – 4 pm and 5 pm – 10 pm. Entertainment includes Magic Man, kids cookie decorating and Universal characters. For reservations, call 407.503.DINE (3463). Enjoy a Thanksgiving Buffet from 11 am – 8 pm. Entertainment includes appearances by Universal characters, kids holiday crafts and activities table, face painter and balloonist. For reservations, call 407.503.DINE (3463). Fort Wilderness Resort & Campground: Mickey’s Backyard Thanksgiving Feast at Mickey’s Backyard BBQ show at the Fort Wilderness Pavilion (three show times on Thanksgiving Day). Trail’s End Restaurant is also offering brunch and dinner. Availability is limited and dining events are subject to change. For information and reservations, guests can call 407.WDW.DINE or book online at DisneyWorld.com/dine. 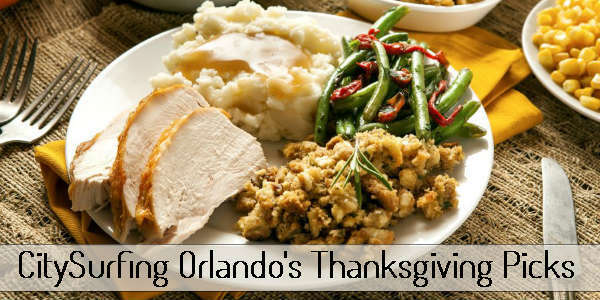 That should be more than enough choices for your family to enjoy their Thanksgiving meal dining out in the Orlando area. Happy Thanksgiving to you and yours, and Bon Appétit!